We’re in the middle of the most epic weekend retreat for us geeks: San Diego Comic-Con. It’s a time where movies, television, comics, toys, and cosplayers come together (and, yes, you can join them if you want!) to let their inner children run wild. But like all vacations, it’s sometimes hard to find the time and place to work out. Motivation gets tough. I get it, running around hopping from hall to hall, event to event, site to site, is tiring in itself. And the food offerings in the Gaslamp District are mainly overpriced, poor quality burgers and chicken tenders. It’s tough to feed the mass crowd of SDCC! But I’m here to motivate you: Try not to sell yourself short or break your growing routine of health and fitness. It’s fine to eat what you will–I get it, you’re on vacation! But don’t let any of those obstacle such as time and snacking stop you from having a good few workouts, that can even be done in your hotel. Most hotels will have a gym, or a space where you can work out. Here is a simple program that you can do once, twice or every day while you’re in San Diego to maintain your workout progress – or even just to uplift feeling slothy after a night partying it up with fellow geeks. Best part? It will take you only 30 minutes or less. Use a timer on your phone or computer and go! This program has a warm-up, followed by 4 exercises that are push, pull, leg and core. Of course after any workout, (and before if you can for that matter) you gotta stretch. Allocate 5 minutes for that. 25 Seal taps – lay onto your tummy, get into superman position and extend your arms out and back to tap your nose. That’s it! That’s all you need for a full body workout, and you can repeat this during your stay at SDCC or at any hotel for that matter. If you see an object that can add weight, use it! Water bottles, suitcases, even that heavy prop you purchased. I like to carry with me resistance bands every time I travel. They take up barely any space and they are great for adding more power during a traveling work out. Any questions, please connect with me. 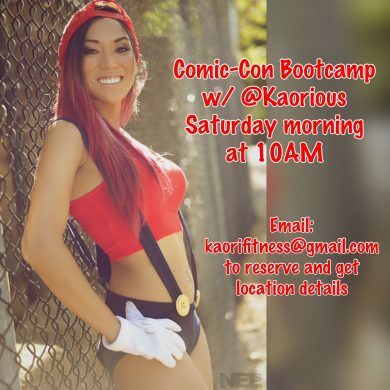 I’ll also be running a live workout on Saturday morning and would love for you to join me! Email me at [email protected] to get on the list and start your Saturday morning right!